Home » Carousel, Educators/Parents » Friend or Foe? Students learn that some microorganisms are beneficial to humans, while others are harmful. All living things require a constant supply of nitrogen. Although there is a lot of nitrogen in the atmosphere, it’s not in a form that most living things can use. Instead, most plants get nitrogen from decomposed organic materials in soil and from fertilizer. Legumes such as peas, beans, and clover have a unique way of obtaining nitrogen — they form a symbiotic relationship with a certain type of bacteria called . The bacteria form and live in small nodules on the plants’ roots and turn nitrogen in the air into a form usable by plants. Because of this nitrogen-fixing relationship, legumes require little additional nitrogen fertilizer. In return, the bacteria receive carbohydrates from the roots. – Ask students, What are microorganisms? Are they beneficial or harmful to humans? … to plants? In what ways? Could we live without them? – As a class research common types of microorganisms and create a chart to organize the information. Include facts such as microbe name, category (bacteria, virus, fungi, or protozoa), brief description, and why it’s beneficial or harmful to living things. Discuss your findings. – As an example of a beneficial microorganism, tell the class about nitrogen-fixing rhizobia bacteria. Explain that even though many types of these bacteria are found naturally in soil, farmers often inoculate legume seeds with a dried form of the bacteria to improve growth. Ask the class to research the symbiotic relationship between rhizobia and legumes and then develop a hypothesis to test the relationship. – Set up an experiment using two groups of pea or bean seeds to test your hypothesis. For example, moisten and inoculate half the seeds (Group A) with rhizobia; the other half (Group B) is your control. Plant the seeds in labeled pots filled with sterile potting mix. As the seedlings emerge and grow, record measurements and visual observations every day. When the plants have matured, pull them out of the potting mix and examine the roots. Students should be able to see the small round nodules that have developed. Review the data the class recorded during the experiment. 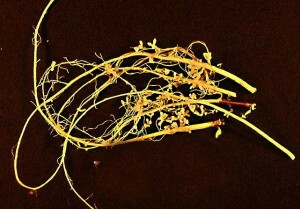 Did the rhizobia improve plant growth? – To expand the experiment, also test for the presence of rhizobia in your school garden’s soil. For this setup, you’d need 4 experimental groups: (A) seeds inoculated with rhizobia planted in potting mix, (B) control seeds, not inoculated, planted in potting mix, (C) seeds inoculated with rhizobia planted in garden soil, and (D) control seeds, not inoculated, planted in garden soil. – Stage a debate. Tell students that scientists have discovered a new chemical that could kill all microorganisms in our environment. Divide the group in half, with one group arguing for elimination of microorganisms and the other arguing against it. Following the debate, take vote to see whether or not the class thinks it would be a good idea to eliminate all microorganisms. – Build a compost pile and explore another group of important microorganisms — composting microbes. This is an interesting topic to explore because the types of microbes present in a compost pile change as the temperature of the pile changes.